From Higashiguchi(East Exit) of JR Meguro Station, walk to the left, pass by the Docomo shop on your left, turn again left into the first narrow path and walk along the railway on your left until you see a “Coin parking”on your right. Then turn to the right at the next corner. Turn to the left just before you reach the next “Coin Parking”. Proceed straight, passing by a postbox, up to two green houses on your right. 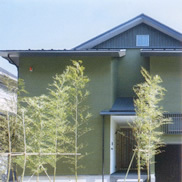 The second green house from the corner is Yakata Yousai. Yakata Yousai, when requested by a customer to correct, add, or delete the customer’s personal information, will correct the personal information of the customer within the scope required to accomplish the utilization purpose and notify it to the customer after conducting a necessary investigation without delay, unless otherwise specified by the relevant laws and regulations.